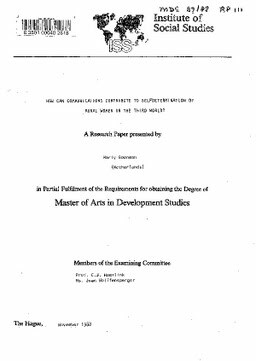 Erasmus University Thesis Repository: How can communications contribute to selfdetermlnation of rural women in the Third World? How can communications contribute to selfdetermlnation of rural women in the Third World? My research question is: How can communications contribute to self determination of rural women in the Third World. Hardly any information is available about the lives of rural women in the Third World. Generally they are portrayed, especially in the mass. media., .as passive victims and not. as producers. The Western norms. and values are dominating the structure of international communication. This has consequences for the process of development and often even hampers endogenous cultural development. Throug the introduction of communications in development women tend to loose the ways in which they have always coped with their own environment.